The saints got over this lack of clarity and lived like they could see the invisible. This allowed them to accept invisible realities without having fear of the day when the glass panes would break or the veil would fall. The Heavenly tribunal was already familiar to them, and they viewed the pass through the vale of death as a long awaited touch that would bring them forever into the association of the elect after their exile, they finally will be free. The time on earth is a time of desire and hope; Heaven is possession for eternity. If we do not desire Heaven while we are on earth, then we are dying persons who can still be revived. If we focus our extent for desire on the material world, then we are terrified of the moment of our death, because we will lose all our false treasures. Being less allured to material things will certainly cause us to await the eternal life with joy. The visionary Marija has already been given some knowledge about this subject to us. Virgin Mary explained to her in a message that in Heaven each of the chosen ones knows exactly what other people have done for them, and how they have done it. By their prayers, sacrifices and offerings, they became a part in increasing the degree of their eternal glory. Sometimes, the chosen ones realize that the prayers for them were the reason that they were not lost! In Heaven, each one of us will be eternally grateful to each one of these people who prayed for us and kept thinking about us, and we will have a very special bond of love with them. This reality is incredible and encouraging, especially because we often do not see the fruits of our sacrifices and prayers for those we love while we are on the earth . Virgin Mary gives us the hope that can heal us of our demoralization! She can help us to invest in real values! 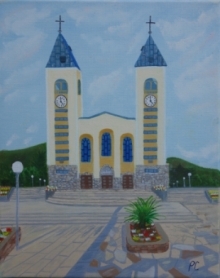 Visit Medjugorje, accommodate yourself in one of the beautiful Medjugorje hotels and feel the special atmosphere there and find the truth about death and heaven.